Black and White chefs aprons embroidered with Mr.
Black and White chefs aprons embroidered with Mr. Right and Mrs. Always Right . 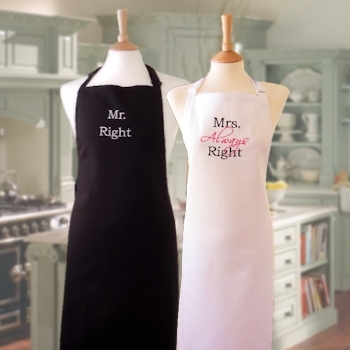 This his and hers black and white apron set make a truly special gift. We will embroider and make each of these aprons especially to order. We use quality polycotton high performance chef aprons made using a sturdy polyester and cotton blend for durability and easy care. Has adjustable neck strap and long waist ties so you can adjust to fit most all adults. Great for light to heavy duty cooking, professional catering and chefs, or just cleaning or barbeques! Measures approx 72cm wide x 86cm long. You get 1 black apron and 1 white apron in this gift set.